The Indonesia’s Train Company (PT KAI) currently serves five types of coaches. They are economy, business, executive, priority and luxury coaches. The Company launched the priority coach on August 2017. On June 2018 it introduced the luxury coach. As a fan of train traveling. I love to try riding the train whenever I have the chance. It is not only in Indonesia but also when I visit other countries. The term “priority” caught my attention. I was curious to travel by priority coach train. On the weekend I tried to ride this priority coach from Jakarta (Gambir) to Jogjakarta (Tugu) with Taksaka train. I have traveled by executive coach train which is comfortable, air-conditioned and punctual. So I think riding the priority coach must be a better experience. What makes the priority coach different? First of all, the fare is different. For the same distance the priority coach’s fare is double. There is only one 28-seat priority coach in the Taksaka train. The other coaches are executive. The priority coach is usually put on the tail end of the train. Its interior is different from the executive one. The carpet layers its floor and the window and wall of the coach interior are plastered with woods. The seat is more comfortable than the executive one as you can recline it for sleeping. There is an LCD screen in front of the seat. Unfortunately, there is only one channel and no headset is provided in the coach that I rode. 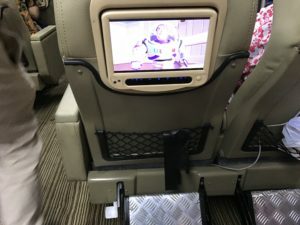 There is a large LED TV screen on the wall by the front seat, in case you are boring with the Toy Story on the screen in front of you. Overhead the seat is a compartment to keep your bag while for your big luggage there is a rack in the front. Behind the sitting coach there is a minibar where you can make your own coffee and tea. The minibar interior is also plastered by the wood. There are some chairs if you want to sit there and enjoy your hot tea. The whole coach is non smoking so don’t try to smoke there. 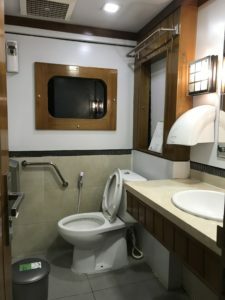 The toilette is bigger than in the executive coach. There is hand dryer as well. For the hygiene, toilette seat paper is provided. It is clean and odorless, but it can be cleaner than in the executive coach, especially the floor. The other difference is an attendant will serve tea or coffee about one hour after the train departs. 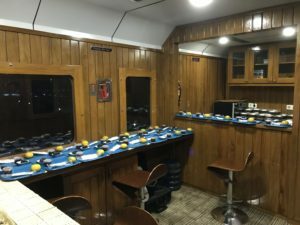 In my case, as I took the night train, the attendant serves dinner about one hour after the tea time. The food is not bad. It is served on a covered plastic container with plastic spoon. 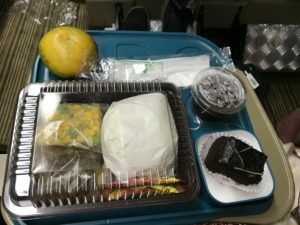 The other passengers and I got Indonesian menu: rice, a vegetable dish, a beef dish, and two sachets of chili paste. I got three deserts, a small cup of chocolate pudding and a small piece of cake and a local orange. Whenever I want to have a drink I just go to the minibar. It’s free along the ride. If I want to sleep all I have to do is to recline my seat. I can recline it until about 60 degrees. Each passenger gets a small pillow and a blanket. The blanket is not really necessary as the temperature in the coach is convenient. It was not freezing. The sleeping quality in this reclining seat is not 100 percent, but it is okay for one night. The good thing in the priority coach is the light is turned off during the sleeping time. I remember when taking the executive coach, the light was turned on all the time. So I needed to bring my eyes cover for sleeping. Which route is served by priority coach? 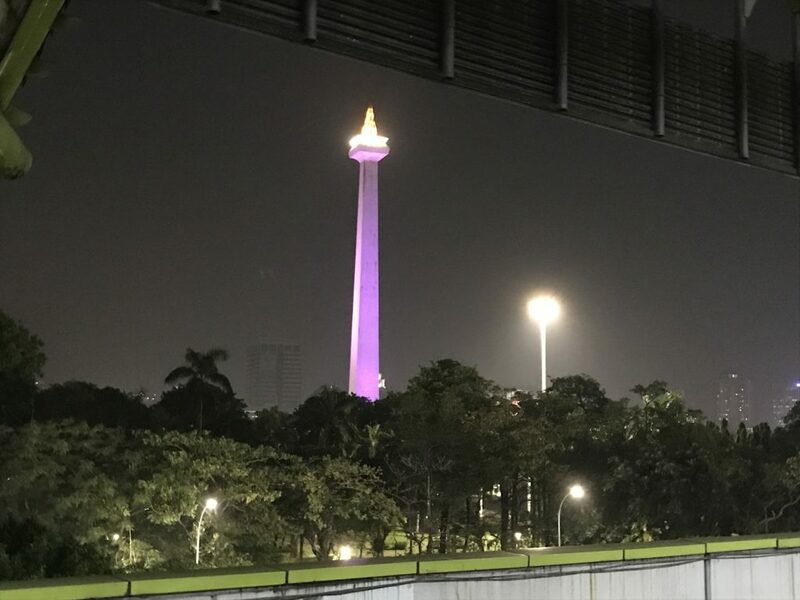 Jakarta-Bandung (one way ticket fare is Rp 200,000), Jakarta- Semarang (Rp 750,000), Jakarta- Jogjakarta ( Rp 900,000) and Jakarta- Surabaya ( Rp 1,350,000). I don’t see any minus point in traveling with this priority coach unless I have tight budget. Because it is more convenient, I don’t have to worry about eating and drinking during the ride. Unless I have a special diet and need to bring my own meal. The seat, the interior and the toilette are more comfortable than in the executive coach. It’s worthy taking this train if you have enough time and budget. Especially, if you are a type of aviophobia or aerophibia. So? Just pack and go! And enjoy your trip! 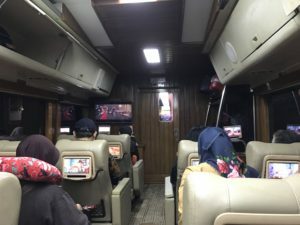 Wahyuni Kamah Travels © 2019. All Rights Reserved.